← The Mystery is Solved! 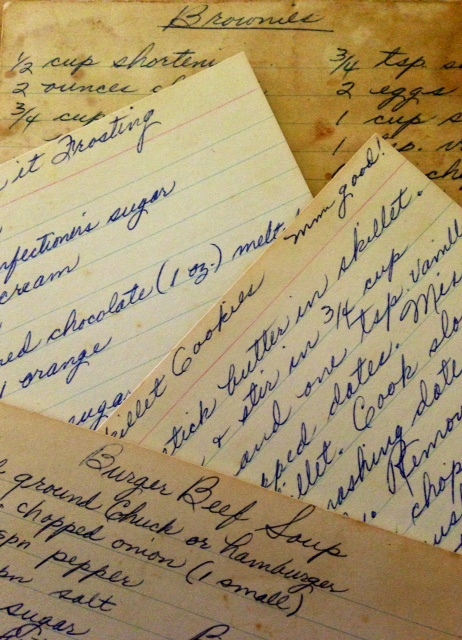 Much loved recipes written in Mother’s own dear hand. Since my darling mother’s passing on Christmas Eve 2014, I have found unexpected comfort in things she left behind. I had no idea the memories each item would inspire in this devoted daughter’s heart. A trinket here, a memento there, some handwriting in a book, or on a recipe card. All much dearer to me, now that she has gone. Emptying a box of stored Mother-stuff, I came upon a tiny, graniteware berry bucket. Mother used to tell the story of family berry-picking adventures, accompanying her two sisters, Nellie and Thelma, and her brother, Dave, out into the berry patch to gather fruit that would become jams, jellies, and juicy pies for dessert. 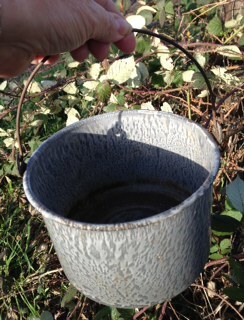 As the youngest child, Mother’s job was to cover the bottom of that little bucket with berries. But she never could. “I always ate them as fast as I picked them!” she would say, laughing. I smile at her memory, which is now a kind of memory for me, too. Represented by the tiny berry bucket. When Mother was slipping into dementia, I told her not to worry, I would hold all her memories close and retrieve them whenever she needed them. That seemed to calm her, something she could accept as she struggled to remember. Now I have all her memories to hold. Plus, memories of her sharing those memories. Precious gems in my treasure chest. Perhaps I’ve been consoled by family possessions for some time. 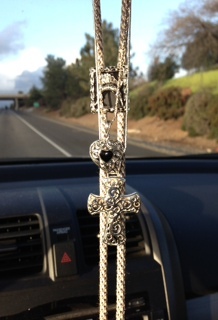 My Dad’s bolo tie’s been hanging from my car’s rear view mirror since his passing in 2005. It soothed me somehow, swinging back and forth, catching the light, reminding me of his handsome appearance and my mom’s pride as she walked beside him, hand in hand. The other day, I added one of Mother’s necklaces to Daddy’s tie. Then another, because I couldn’t decide. Though they are beginning to suggest a bejeweled chandelier, I’m leaving it for now. Their shimmery sparkle brings many memories to light. And I think Mother, a great lover of all things bling, would approve. Where your heart is there your treasures will be. Beautiful. A good reminder to all of us, to write in books and leave precious memories with those we love. It is. And, look at you, lady! Doing more than leaving memories, I’d say. I would have to say-You are the amazing one! Reaching for your dreams! Thank you, Nancy. I know YOU know…. I finally made it over to your blog. And I love it. Thank you, Laura! So kind…. I love this story of how you still treasure the memories and trinkets from your parents!